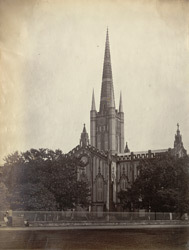 Photograph of the Cathedral at Calcutta by W. G. Stretton, taken in the 1870s, part of the Dunlop Smith Collection: Sir Charles Aitchison Album of Views in India and Burma. Situated on the South-East corner of the Maidan, the Cathedral was designed in the 'Indo-Gothic' style by Major Forbes of the Engineers, also the architect of the Mint. Completed in 1847 it contains many interesting works of art including murals, frescoes and the stained glass west window designed by Sir Edward Burne-Jones.